Dennis Rodman, the former Chicago Bulls NBA champion, expressed high hopes for North Korean leader Kim Jong Un’s upcoming meeting with President Donald Trump, and even included a picture. “Hoping for this after my two friends and leaders meet next month. #Peace #Love #NotWar #Diplomacy” Rodman tweeted, along with a picture of Kim Jong Un wearing a “Make America Great Again” hat, the signature apparel of Trump’s political movement. Rodman is notably a personal friend of both Kim, who has spent time with in North Korea, and Trump, who he worked with on The Celebrity Apprentice. 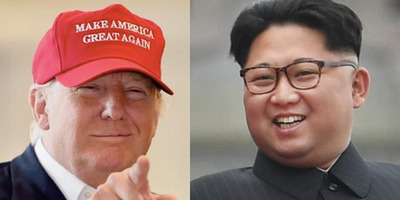 Surprisingly, if Rodman’s wish were to come true, and Trump did give Kim a MAGA hat, it would be the second piece of official Trump merchandise Kim owns, after Rodman brought him a copy of Trump’s bestseller “The Art of the Deal” during the basketball legend’s most recent trip to North Korea. Over the years, Rodman has made several trips to visit Kim, who is a big fan of the 1990s Bulls. Trump has tentatively agreed to meet with Kim in May, after Kim meets with South Korean President Moon Jae-in in April. Kim recently made a surprise visit to China, where he met China’s President Xi Jinping, another mutual friend of his and Trump’s.